I have realized that Tuna Salad and Chicken Salad recipes greatly differ by region, kind of like Chili. So while I will share the way I made it this is in no way the right way. I think it has a lot of potential as a template. Next time I will try other veggies to mix things up a bit. Put all of these ingredients in a food processor with 1/4 cup of water. Process ingredients adding more water if necessary to get the right consistency. Don’t over process or it will be “paste like” it needs to be a little chunky. This made a little more than 2 cups so double the recipe for a large family. 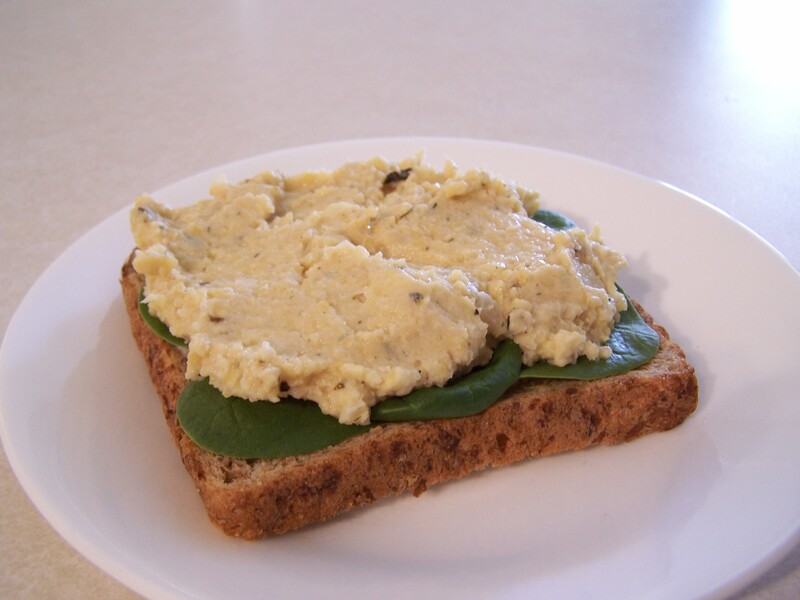 We ate this on sprouted grain bread, my husband had toast. I also like it on crackers or with a pita. It could be eaten atop a mixed green salad as well. If you like celery in your tuna salad add it, I’m not a fan of raw celery so I omited it. I like lots of onion so I’ll add it next time. I was planning on adding a pickle but we were out. A splash of lemon juice would be a nice touch as well. The Sushi Nori dried seaweed gives this the fishy flavor. I read about that on a blog but now I can’t find the post to give them proper credit. If it was you, or you know who it was tell me and I’ll update this. I also referenced The Happy Herbivore Cookbook but found an online version here. If you’d rather have a “chicken” salad just omit the seaweed. Many moons ago I would make a delicious spicy chicken salad. It was simply shredded chicken, mayo and a can of drained rotel. I’d like to incorporate the rotel into this recipe as well. What would you add to give this recipe your favorite “tuna” salad flavor? This sounds really good, I have made something similar to this but just mash the chickpeas with a fork so it stays a little chunkier, I’ll give your version a try! I love the idea of seaweed for a fishy flavor! I love sushi, though surprisingly haven’t missed it this week. Come to think of it, I would like some more Asian flare in the Engine 2 Diet….or I’ll just have to deviate sometime to try other recipes like yours. The food processor can definitely make this pasty. Last week I made it and reserved 1/2 a cup of chickpeas to add toward the end. It was still spreadable but a little chunky. I made this for lunch today. OMG!! Soo delish! I did leave out the seaweed because I wanted it to taste like ” chicken” salad. I also found no need for the water. Added sweet relish! Loved it soo much! Thank you for recipe! Yay Sheri! I’m glad you liked it! I’ve been thinking of making it again, “chicken salad” style!